Chilliwack Harmony Chorus - where YOUR voice matters! Come join us. We perform both US and Canadian national anthems, including a bilingual version of O Canada. Who is Chilliwack Harmony Chorus? Welcome to the Chilliwack Harmony Chorus Website! Are you interested in brightening up your day by receiving vocal training in tuning musical chords to create a unique expanded sound? Barbershop Harmony brings people together to enliven their musical talents by singing three harmony parts around a melody. The engaging environment provides opportunity for fellowship and to nurture each other. Come and experience our a Cappella community chorus singing in the barbershop style. (right beside the Chilliwack Middle School). 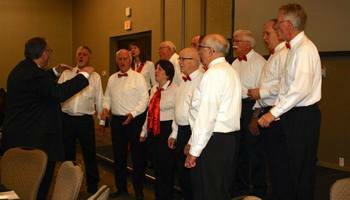 Want Chilliwack Harmony Chorus to sing at your next function? Why not hire Chilliwack Harmony Chorus to entertain at your next event? We can perform at corporate functions, charity events, community Entertainment events, birthday parties, christmas parties, awards nights, weddings, engagements, anniversaries, engagements, and even funerals and memorial services.